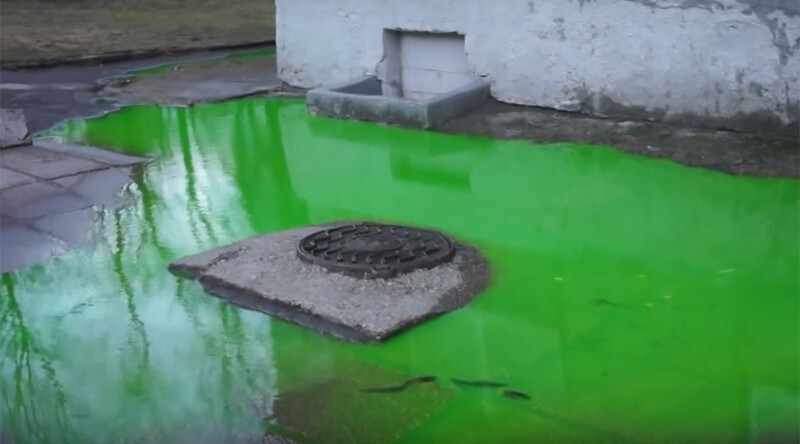 An apartment block backyard in the Russian exclave of Kaliningrad has been swamped with an unknown acid-green liquid. Pictures of it quickly spread across social media. Neither the tenants nor the authorities had any idea how it got there. The mysterious liquid was first noticed on Wednesday, witnesses say. It appeared near a manhole and took over almost all territory near the entrance of the apartment building. “It has no smell, it appeared yesterday, and it’s still there. Everyone who stumbles upon it takes a picture of it,” one of the tenants told Kaliningrad.ru. People have been enthusiastic about posting their versions of what the green thing could be online. Theories range from a doctored picture to a marker leak to an alien execution spot. The company responsible for the water supply system management, “Vodocanal”, said that no maintenance works have been taking place in the area. Other utility companies are planning to send a dispatch service to examine the area. The city’s company responsible for the heat supply system management said it will also check оn the green liquid spill. Kaliningrad’s municipal companies have been using a special organic dye (fluorescein) since 2014, local media reported. The substance, which turns liquid bright green, is a tracer for determining any groundwater leakages. This isn’t the first time Kaliningrad residents have witnessed such an event. In July 2014 the public grew wary when a local pond, a lake and a brook suddenly turned bright green. The authorities then explained the phenomenon being the fault of the dye used during maintenance works conducted in order to check the sewage system. “This substance is not hazardous according to the classification adopted by the EU states. We ask Kaliningrad’s residents not to worry. Fluorescein is certified and officially approved for using as a coloring agent for the determination of water leakages in the networks,” the press service of the City Hall said last year.